Originally titled Desperados-- series creator and writer William Ivory wisely changed the name of this unusual 2008 BBC action dramedy to The Invisibles in a brave double-play on the word. On the one hand it's a direct reference to the handle the press-- and those in the trio of thieves-- dubbed themselves with decades earlier whilst the show's central two cast members (Anthony Head and Warren Clarke) served as part of a trio of untouchable criminals who made off with a fortune and always evaded police capture. However, on the other hand the show's titular second meaning is a subtextual acknowledgment of the way that often in our youth obsessed culture, older individuals become increasingly “invisible” to the rest or the population with each passing year. 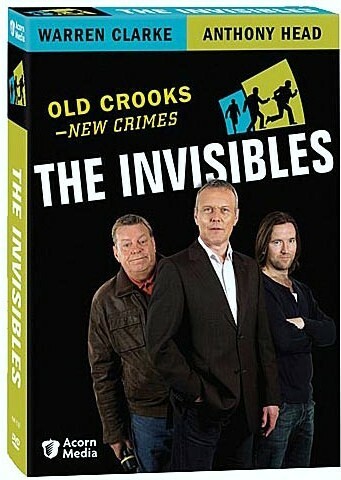 Still on the surface, The Invisibles is a gentle, fast moving, and easily entertaining gem of a show centering on Anthony Head's level-headed Maurice Riley and his best friend and former Invisibles partner in crime Syd Woolsey (Warren Clarke) who return to the sleepy, seaside fishing town of Devon following a fifteen year voluntary exodus to Spain's “Costa Del Crime” to relax with their stash of money. Now back in the UK-- displayed to picturesque effect in this Ireland-filmed series-- and along with Maurice's devoted, lovely wife Barbara (Jenny Agutter) as well as his college aged daughter Grace (Anthony's real-life daughter Emily Head), the men find it difficult to live a life of quiet leisure and retirement in a senior housing community. When the duo realize they have no choice but to reach back into their old bag of tricks in order to settle a debt involving Syd's ne'er do well son, they find an all too willing third amigo in the form of the son of their deceased former partner, Headley Huthwaite (Lennox Kelly) who-- as fate and luck would have it-- runs the local pub adjacent to their new residence. Establishing a nice blend between the comedy and action of the series as the former crackerjack safe-crackers realize that the crime business isn't what it used to be-- soon enough the group's obligation and blackmail induced forays back into life as an Invisible remind them of their undeniable vocation. While you have to greatly suspend your disbelief when you realize that the town is so small that-- especially given the lack of masks that cover their faces fully-- as well as some truly illogical holes especially seen in a “standoff” situation in the final sixth episode wherein a few main characters pretend to be totally different citizens (as though police wouldn't check it out), if you don't think too heavily about it, the show's a great deal of fun. And likewise, it's truly a kick to see the top notch talent involved play off of each other well as they remind viewers of the struggles of getting older and trying to start over when you realize that you're not exactly prepared to settle down like a far more genteel version of Quentin Tarantino's excellent Jackie Brown. Moreover, throughout the series this is coupled with a great interplay between Clarke and Head as their codependent relationship is just as involved as a true marriage (echoing a friendlier Grumpy Old Men) since aside from being dubbed a top “wheel man” who can't be beaten on two wheels or four -- Syd is a bit too absentminded to be dubbed the “memory man." Essentially you can think of it as the anti-Leverage--a.k.a. TNT's too cool for school Timothy Hutton starring high tech version of Robin Hood. And adding to the fun, Ivory works in a few wholly original, clumsy Keystone Cops meets Big Deal on Madonna Street moments all of which augment the work from being just another far-too-smooth heist series. A great parallel plot develops as the show continues on which finds not only Hedley questioning his involvement in The Invisibles upon realizing he's going to become a father but Maurice also facing in retrospect the ways his own decisions in raising his daughter under the strict assumption that he was a dull banker may have found him placing “work” ahead of family much too often. And while again it's a bit hard to believe that Emily Head's Grace has never put some of the inconsistencies about her dad together before, it's a riveting multi-episode storyline. However, and much to our disappointment, Ivory ultimately sacrifices the tension that had been established with the sudden near-overnight decision that Grace's otherwise intelligent character makes in deciding to leave the UK and head to the United States to become a stripper a.k.a. a “burlesque artiste." Disturbingly going for what she wholeheartedly assumes is a smart and very profitable career move, Ivory again takes away from our empathy for her sheltered and unrealistic character. However and maybe in a sad ironic justification of our obsession with youth in contemporary society, the series which has recently been released in a nicely packaged DVD from Acorn Media complete with a 16x9 cinematic widescreen aspect ration and English subtitles for the deaf and/or hearing impaired, will not be renewed for a second season. Although the original audience of 4.7 million fell to 3 million by the time the finale aired and the BBC lamented that despite their pride in the project it simply didn't find its audience, at least now with the DVD release, it still plays as a nice (and thankfully cliffhanger free) entertaining six-part, rollicking miniseries.